I’ve been working in Haiti for about a decade to reduce maternal and infant mortality by increasing access to skilled maternity care. Skilled attendance is a proven intervention to reduce preventable maternal and newborn deaths. 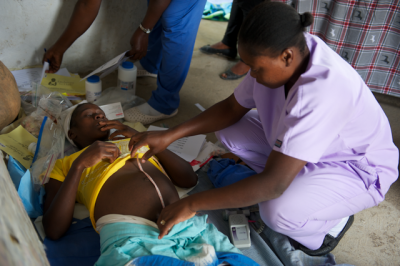 In Haiti, only about 25% of women have access to a skilled attendant during their delivery. Many don’t have access to prenatal or postpartum care, both of which are so important to reduce complications and ensure safe motherhood and a healthy beginning for newborns. Childbirth, anywhere in the world, will always pose a risk. Prenatal and postpartum care, and delivering with a skilled birth attendant mitigates that risk. But there are complications that can arise with even the healthiest mothers who have had the best prenatal care. 1. The baby may not breathe on it’s own after birth. This happens about one percent of the time and is more frequent if the baby is premature or has been exposed to certain medications. But it can happen to anyone. It kills about a million babies each year in this world. 2. A piece of the placenta remains in the uterus. This only happens about 4% of the time but can be a cause of heavy bleeding and can happen to anyone. 3. The uterus can bleed too much after birth by not contracting well on its own. It is more common if a piece of the placenta remained inside but it can happen to anyone even if the placenta was completely expelled. 4. The baby’s shoulders can get stuck in the pelvic bones. This is more common with big babies but can also happen to anyone. 5. The baby’s cord could prolapse, or come out in front of the head. It is more common when the bag of water is broken artificially but it can happen to anyone. 6. You can get an infection. In even the cleanest of situations there are bacteria that you can be exposed to during birth. 7. The baby could be stressed by the labor and not get enough oxygen. This is more common if the placenta is not healthy but can happen with even healthy placentas. 8. The baby could be in a position that makes it difficult to exit the pelvis well and labor could go very long. 9. The uterus could invert- turn inside out while the baby is coming out. It is pretty rare but sometimes happens to women who have had a lot of babies. 10. The placenta could be retained and not come out at all. This may be because of conditions where it grows into the wall of the uterus or just will not detach on its own for some reason. These complications can happen to anyone, anytime, and anywhere in the world. Whether one chooses to birth at home, at a birth center, or in a hospital, having a skilled birth attendant has been proven to make the difference between life and death for mothers and babies. 1. The baby could die. 2. You could bleed to death. 3. You could bleed to death. 4. The baby could die. 5. The baby could die. 7. The baby could die. 8. Your labor could be so long you and your baby could die. 9. You could bleed to death. 10. You could bleed to death. So, every two minutes in this world a woman is dying from preventable causes related to pregnancy or childbirth. 99% of these deaths occur in developing countries. And the babies- more die on the first day of their life than at any other time. At least 114 died in the hour I wrote this- the majority from preventable causes that a skilled midwife could have prevented. Christy Turlington Burns is a model, global maternal health advocate, and founder of the maternal health organization, Every Mother Counts. After a perfectly normal, natural birth, in a state of the art birth center next to a hospital in New York, she had a post-partum hemorrhage (PPH). Her situation required rapid intervention by the midwife and doctor who were caring for her to keep her from bleeding to death. Soon after, she educated herself on PPH and realized that if she had not had immediate access to care, she would have died. Christy knows why skilled care at birth matters. She became passionate about helping more women have access to skilled care in even the most impoverished situations. She knows why Midwives For Haiti is training skilled birth attendants and that these men and women are making a tremendous impact in their communities. We are grateful for all of you who know, too.